Looking for an eco travel trailer that is also an ultra lite RV? 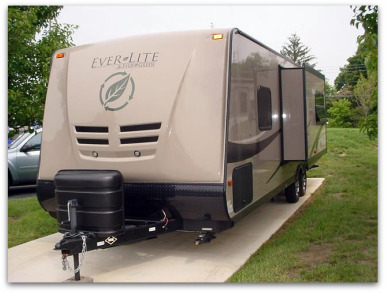 EverGreen Recreational Vehicles LLC also known as EverGreen RV has created the eco-friendly Ever-Lite trailer made of ComposiTek construction rather than the traditional wood products. The ComposiTek makes the trailer four times stronger than wood construction yet it weighs less, is very durable and will not separate, deteriorate dry rot, mold or mildew. The Ever-Lite trailer and the new 2010 fifth-wheel eco RV model comes with all the amenities of a fully equipped RV such as; flat screen TV, solar battery charger, exterior speakers, no-crack vinyl flooring, satellite and cable hook-ups. 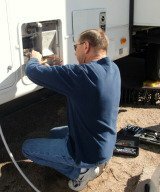 An EverGreen RV also includes a structural warranty, bumper to bumper warranty. The roof is constructed of an Energy Star Rated vacuum laminated one-piece molded roof system and has a 12 year roof warranty. You can find more information about these green RV products at goevergreen.com.